"But not spelling or writing in coherent English, which you might think was a bit more important." 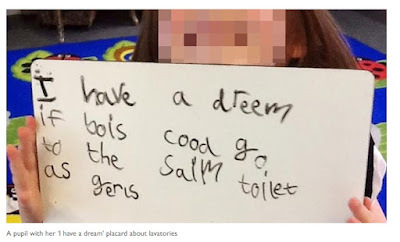 "Now, if you're wondering how they have time for this, well, this picture from the 'Times' will give you a clue:"
"Speaking as an ex-teacher of Year 1 and 2 children, I very much doubt the above sentence was written by a five or six year old. 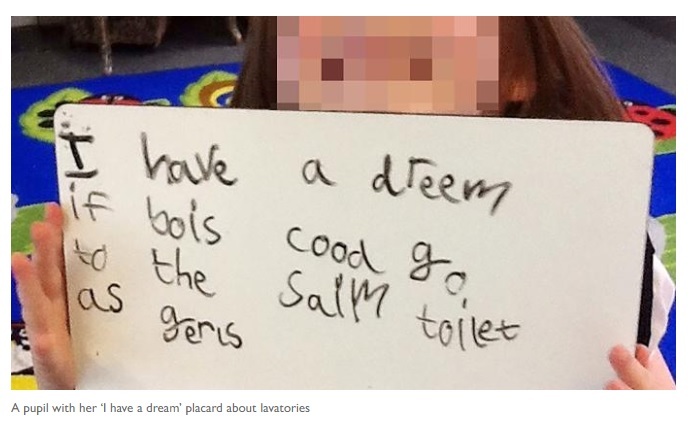 It looks as if it has been written by someone trying to mimic the phonetic spelling of a young child." I wonder what the outcome of this is going to be for the Christian parents here? Will they have their views respected and their children not subjected to what is in effect LGB and T propaganda? Will the propaganda be stopped as it has been for Muslim parents in Birmingham? Having read Huxley's "Brave New World" some 50 years ago (and re-read a few times since) I can see where this is heading - and the process behind it. It is most definitely not what the majority in this country want or approve of. Our elite would do well to mark the words in 1962 of one J F Kennedy; "Those who make peaceful revolution impossible will make violent revolution inevitable." That hadn't occurred to me but, looking at the picture again, I think you're right. The letters are too well formed and it's all too cutesy. "Objecting to this crapola is career-destroying..."
And in the case of those cops busted for waving Pride flags outside the Sultan of Brunei's hotel, very confusing! "That's the (currently) highest rated comment - there are a few more expressing this, most cynical, view of what might have happened..."
Haven't we all become so cynical because we are so often proved right? "I wonder what the outcome of this is going to be for the Christian parents here?" "Our elite would do well to mark the words in 1962 of one J F Kennedy; "Those who make peaceful revolution impossible will make violent revolution inevitable.""